We realize that it has been a holiday-shortened week and everything, but you can’t get much more boring than the last three days of trading. Heading into the final trading day of the week, the S&P 500 is within one point of where it closed out last week. That could change today, though, as the S&P 500 is indicated to open higher by about 10 points. That won’t be enough to bring potential resistance levels into play near 2,800, but it’s a move in the right direction. Today’s catalyst for higher prices? Optimism on a trade deal with China on news that President Trump will meet with Chinese Premier Lui today at 2:30 PM. What else is new? There’s no economic news on the calendar today, but Fed speakers will make up for the void as nine members of the FOMC are scheduled to speak throughout the day. Nine! Read all about overnight events around the world and this morning’s news in today’s Morning Lineup. As mentioned above, the opening gap won’t be enough to bring potential resistance at 2,800 into play. 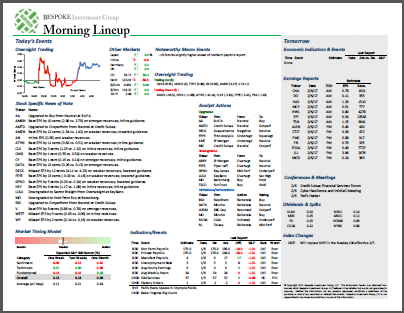 Below are updated S&P 500 and Nasdaq composite charts that we highlighted in last week’s Bespoke Report. 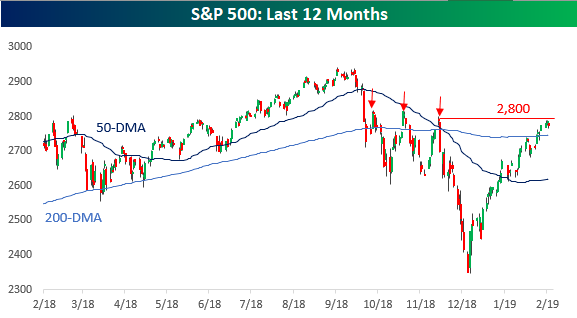 Even with more than 90% of S&P 500 stocks above their 50-day moving averages, it still has yet to make that higher high that we have been waiting for. 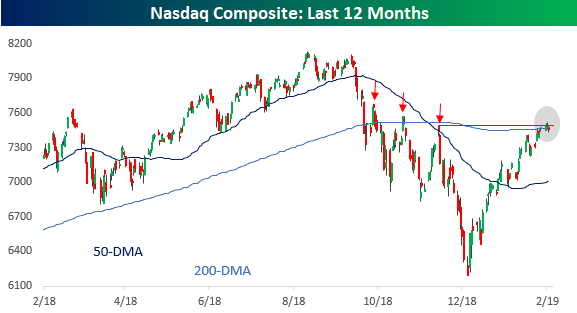 The Nasdaq, meanwhile, briefly made a higher high and peeked above its 200-DMA earlier this week, but fell back down below that level yesterday.